Northern Pacific Railroad depot at Noxon, on the left side of the main line and the siding-spur. Boxcar housing for employees and the Sectionman's house is on the right side, nearest the town. The water tower is east of Weare's Post and Poles Store, the last building in view on the right. Courtesy Blanche Gordon Claxton collection. A winter in western Montana, compared with other northern latitudes, was considered mild. High winds and drifting snow were lacking and temperatures seldom went down to the extremes of central and eastern Montana or the Dakotas. But weather, ever fickle in the mountains, reared back to batter the valley in 1915-1916. Since early in November 1915 snowfall after snowfall kept Bull River road supervisor, Marion Cotton, busy shoveling county bridges. Between times he managed to butcher a beef or a hog. Like the other log barns in the valley, the cedar shake roof of Cotton's extended several feet beyond the front of the building. Beneath this shelter he hung the carcass from a pulley attached to the roof beam. With razor sharp knives he peeled hide from the steaming beef, then neatly dropped the intrails, hooves and head into the waiting tub beneath it, to be hauled into the woods and left for coyotes and scavengers. Hogs were scalded in a huge barrel of hot water, dipped just to the precise point where their hair could be easily 'slipped', or wiped away, leaving a clean, smooth hide over the thick layer of fat which made the carcass appear opaque, rather than pink. Using the pulley and rope sling, he hung the porker, held at a height easy to work on while he deftly carved it into quarters. When the meat was aged about a week to ten days, Cotton wrapped it, loaded it on his sleigh, hitched the team and took the loads of pork and beef to town. When winters are rough fellow residents are easily displeased. Earl J. Lockman snowshoed into Noxon to take the train for a weekend business visit in Thompson Falls late in January. He presented the clerk of the board of county commissioners with a petition signed by all but three residents in the Bull River district, asking his appointment to the position of road supervisor in place of Cotton.*1. Noxon. Circa 1916. 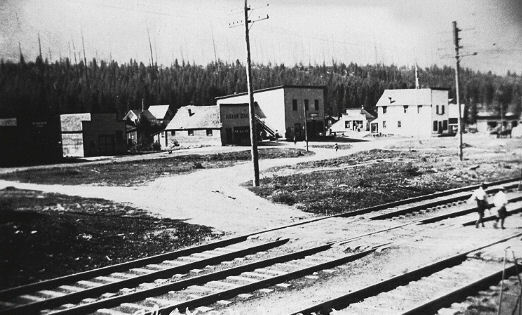 East to west, Finnigan's Saloon, Hay and Grain Store, Maynard's Saloon, Peek's Store, Buck's Store (in rear) and Baxter Hotel. Courtesy William Finnigan collection. Deep snow also held hazards, dealt swiftly and without warning. Mr. A. Baker and his partner, Jim Millar, owned a fine copper prospect on Pilgrim creek. The two of them were working it alone, expecting to put on a force of miners in the spring. Samples of their ore taken to Spokane for treatment gave good returns in copper and silver. While on his way from tunnel to cabin, Baker narrowly escaped death when a snow slide thundered down the mountainside. Hearing it, Baker tried to outrun the racing avalanche but he was "buried under eight feet of white death." His partner, who was working in the tunnel, heard it and hurried out. Baker was nowhere in sight so Millar went to their cabin. Seeing the slide and not finding Baker, he suspected what had happened. Helped by Anton Thomas and others he got to help, they shoveled frantically for several hours before Thomas' shovel struck Bakers arm deep down in the snow. "They fortunately chanced to dig in the right spot, otherwise Baker would undoubtedly have perished." No bones were broken and Baker made a safe recovery.2. Railroad travel also was restricted. John Christenson, roadmaster of the Northern Pacific, had problems similar to Cottons. Snow was about two feet deep at Trout Creek and from there it gradually increased until a depth of four feet was reached at Sandpoint. He had snowplows working but no sooner got the road cleared in one section when another portion of the track was again buried under "the beautiful". Already more snow was piled in the mountains than there had been in the entire season for years past.3. Jess Beason in the timber stand on the bench up back of his homestead house. Circa early 1900s. Courtesy Clayton Bauer collection. The Sanders County Independent Ledger to its readers that war was the determining factor in the timber and mining business of the valley. "In its demand for lead, copper, zinc and kindred metals, (the war) has caused active operations all through the mining districts, resulting in a big demand for mining timbers, and this is where it hits us locally."5. Mining timbers were being shipped to the mines in Butte while "the southern states are receiving big orders to be shipped to the battling nations, notably an order from France for four billion feet of lumber to be rushed across the ocean as quickly as possible."5. The Hope Lumber Company advertised for bids for logging "and putting afloat in the Clarks Fork river all the good, sound and merchantable saw log timber, down or standing," on several portions of their land in Sanders county. But it wasn't to be logged until the following winter, the contract running from October 1916 to May 1917.6. Over near Tuscor, Bunn got his sawmill into operation.7. 'Red' Rhinesmith, Charles Ellis and George Hampton, recently returned from Minnesota, went to work in it. George stayed two days, coming back Monday saying it was too cold for him.8. Ice in Noxon slough, 20 inches thick, was the thickest ever seen here. A great amount of ice was put up in sawdust-insulated bins to supply next summers needs. The railroad shipped in "some beautiful blue ice" for the section house from Blossburg.8. Local needs also employed a few of the most energetic. 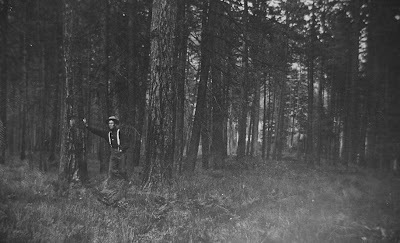 School District 2, Thompson Falls, wanted 75 cords (two ricks to the cord) of green-cut body tamarack and fir two-foot wood, to be cut during the months of February, March and up to April 15, 1916. Sealed bids would be accepted "to be delivered and piled on the high school grounds in Thompson Falls, Montana, no sooner than September 1st and not later than December 1, 1916."9. Provisions stockpiled against winter dwindled. Mr. Scheffler had to snowshoe to town because the roads were so badly drifted.*10. As soon as they cleared enough, in order to replenish their supplies, J. P. Collogan took another beef to Noxon and arranged to bring in several loads of hay for the local merchants when the roads got better, bartering for needed groceries, kerosene and a few necessary household and ranch supplies.11. George Gardner, Harry Wilson and Clayton Bauer goint to town in the buckboard. The hats they wore were the highest fashion, which every well dressed male in the area wouldn't go without. Circa early 1900s. Courtesy Clayton Bauer collection. This group of ladies and children was taken at Noxon, circa 1916-17. Left to right: Freeman, Mabel (fulks) Ruby (Fulks, Goldie (holding baby, Don Saint), Mary Hampton (holding baby Maude Baldwin), Fern Fulks Saint (holding towel. 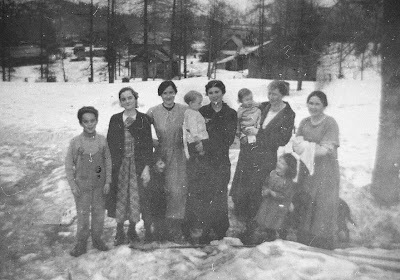 Children, Tana Saint (next to Fern), Bob Saint (between Mabel and Ruby.) Courtesy Ben F. Saint collection. William Ellis bartered a load of posts in Noxon;12. Cotton took in a load of pork and apples;13. January 14, 1916 Walter Lake went to Noxon for a load of hay. (Lake lived a couple of miles downstream from Collogan). Frank Conley trailed the last of his beef herd to Troy and sold them.14. 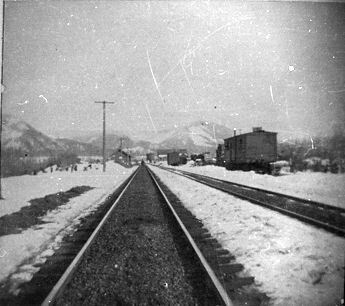 Mrs. Beam arrived on the train from Spokane to visit in Noxon in mid-January.15. Her husband had taken an interest in Mr. Buck's store, but had not moved his family yet. While she was in town the week long cold spell, that had plummeted temperature to 22 degrees below zero, broke and the thermometer rose steadily from near zero to 30 above, bringing 18 inches of new snowfall overnight. She left before the month was out and Mr. Beam went back to Spokane the following week, leaving Noxon for good, though he had made a number of friends.16. The population diminished by two, and then increased by three. Sam Shafer left for Pittsburgh, PA, his old home, and Rev. John Lang, leaving his wife behind boarding at the F. I. Diver home, left for Washington. But George Hampton and Adrian Ellis had returned from Minnesota where they'd been working as linemen on the NPRR having left last summer with Mr. Jackish, a foreman who worked at Noxon for some time.16. Mrs. Bauer, the mid-wife, delivered an eight pound baby girl, Grace, to Mrs. Hazel Ellinwood.*16. Mrs. Ellinwood visited at Mrs. Bauer for about three weeks until the infant was judged strong enough and the mother recovered sufficiently. When her husband came to bring her and the baby home Miss Silver Knowles went along to help her for a day.17. Caption: Granville 'Skinny' Bauer and team. Courtesy Clayton Bauer collection. On Groundhog Day the homesteaders were saying, "according to the groundhog theory, our winter shall soon give way to spring. Here's hoping; but who has faith in the groundhog?"18. Their lack of faith was well grounded for while Noxon was having severe cold weather, down to 22 degrees below, the west coast suffered through 5 weeks of stormy weather. Dooley, in eastern Montana, was near starving while blizzards kept supplies from reaching them. They'd had no mail for 3 weeks. Coal supplies were exhausted. Lumber was being burned for heat. Their situation was desperate. For the first time in 35 years horses were dying on the ranges in Eastern Montana due to two feet of snow, intense cold and persistent storms making range feeding impossible. Losses expected to aggregate to 50 percent. Snow blocked the Rail lines for three weeks.18. Neighbor helped neighbor as much as possible so when Napoleon Laramie took sick that winter Carmichael took care of him. But when John Coyer, of Bull River, suffered a stroke January 28, paralyzing one side of his body, Jim Berray took him to Plains Friday night on No. 4 train. Coyers paralysis required medical treatment only a doctor could give.19. Chas. Mercer was confined for two weeks in a dark room, recovering from a bad case of snow blindness.20. As the thermometer rose, river ice cracked, thawed and began to move. The foot and a half of heavy, wet snow that followed soon turned to slushy torrents raising the ice clogged waters of the Clark's Fork to a rampaging February flood the likes of which hadn't been seen in years.21. In addition to the tremendous amount of damage it did there was danger of flooding the railroad line again. With the impassible condition of the wagon roads during the unusual winter breakup settlers feared being totally cutoff. But temperatures soon dropped again, halting the melt enough to relieve the situation. Speculation flourished as to what spring would bring. One of the favorite sports old-timers had was 'enlightening' newcomers. The 'good old fashioned' winter provided plenty of nourishment to their sense of humor. Newcomers were prime candidates to be told the most dire predictions.21. Glen Dodge circulated a petition in Noxon for a free ferry at Smeads while the Noxon "ferry has been running so slowly this bad weather, a large amount of posts have piled up across the river near the ferry landing, awaiting better weather." Ferryman Ed Hampton blasted the ice away from the ferry landings at Noxon during the week. When Earl Engle and Frank Anderson returned from a two-week trapping trip up Rock creek they were able to cross. Carried on during winter months, a trap line could be extremely profitable and the rancher who had an 'off' season with his crops usually found the skins of mink, skunk, beaver and muskrat producing a source of revenue that helped materially. But Anderson and Engle were not overloaded with furs.22. Caption: George Bauer and Loren King. Courtesy Clayton Bauer collection. As the weather settled into normalcy no one was willing to ignore the problems that sunny weather would bring. Extreme high water was certain to upset their routine and isolate the north-siders from the railhead. The inadequacy of the ferry system, whether free or fee, was the major concern the dancers talked of at the masked ball at Peek's hall.23. Should the county build a bridge at Noxon? Word went around the crowd and a meeting was set up early the next week to decide what to do. Taxes and war news provided ample worry to nearly everyone. A substantial list of persons with delinquent property taxes for the year of 1915 appeared in the newspaper. Those named on the list were hardly disposed to urge legislators to impose more taxes when they knew that unless the delinquent taxes, together with the costs and percentage, were paid the real property upon which the taxes were a lien would be sold at public auction. Very soon they could be standing on the courthouse steps at 10 o'clock in the morning listening to someone else become the owner of the homestead they'd sweated and suffered for, just as others had on January 17th. They knew E. L. Stackhouse, Treasurer of Sanders County, had to follow the law, but some took it personally just the same. The economy had been sliding downward at an alarming rate in the valley since the 1910 fire.24. Caption: George Gardner and Loren King. Courtesy Clayton Bauer collection. Ernest Raynor was among the most talked about young men of his hometown having enlisted in the US Marine corps at San Francisco, California in mid May last year. Until the order came to embark on the San Diego, he was stationed with the battalion of marines at the San Francisco exposition. Now he was with the expeditionary force of United States marines hurried to the west coast of Mexico to prevent a possible massacre of Americans and other foreigners by hostile Vaquis in the vicinity of Topolohampo (Sinaloa, Mexico, a port on the Gulf of California)25. Ernest, son of Mrs. Harriet L. Raynor of Noxon, wrote home that a "marine's life is kept filled with excitement and adventure," saying he goes to all parts of the world in the performance of duty and he'd had many interesting experiences while serving with the soldiers of the sea.25. After leaving Topolohamp (Topolobampo) he was with "the expeditionary force of U. S. Marines ... rushed to Santo Domingo for the protection of the American Legation there during the ... revolt against President Jimines..." (During the fight with rebels over Santo Domingo, Mexico, 1914-1918.)26. While the war escalated, a request from Laurence R. Kelley, Bitter Root, MT, was published in the Sanders County Ledger soliciting men to "organize the second regiment of infantry of the Montana National Guard. Noxon elementary school classes, grades 1-8. Circa 1917-20. Courtesy Clayton Bauer collection. Under Montana state laws three steps were necessary for the formation of a militia company: a petition bearing the names of not less than 70 men; petitioners had to be between the age of 18-45; and petitioners had to guarantee an enlistment for three years. "It is desired that 12 companies be organized at once, so that arrangements can be made for a regimental encampment in the summer, covering a period of from eight to ten days and modeled after the Plattsburg, N. Y. military training camp of last year. "The War department will be asked to detail an army officer as instructor. Attention will be given to battalion and regimental formation, combat, parades, reviews, and skirmish drills and marches, a regimental shoot and inter-company athletic contests."27. "I think every state should have a fairly well organized and equipped state militia. In case of war with a foreign nation it could be made of great aid to the national troups. I am more favorable to encouraging the organization of state militia than I am to the proposed continental army, advocated by President Wilson, which does not meet with my approval and which I do not intend to support."27. The editor noted that the Second Regiment, Montana National Guard, had been in existence for a number of years, "and it is likely Kelley is desirous of organizing an additional regiment."27. Crossing the ferry didn't prevent attendance by a large crowd at the special moving picture show presented Wednesday evening. A large gasoline lamp had been installed in the Noxon School, replacing the oil lamps that had given poor service at evening meetings. Attendees into the little schoolhouse eagerly; concerned about the wars being fought far away they wanted to know more. The manager of the show had gone "around the world with the United States fleet in 1906 and was, therefore, able to lecture on his war pictures and views of foreign countries. After the pictures were shown he gave his views on preparedness."28. As rythmical as seasons changed there was a constant coming and going from around Noxon. The 1910 fire had destroyed a lot of jobs, but at the same time it opened up vast acres for grazing. Over 6,000 head of sheep were brought in by rail and trailed to the slopes.29. Harvey Kirschbaum, a young man from Missoula, arrived at Bull Lake in a covered wagon. He liked what he saw and settled down to homestead at the southern end of the Lake.30. Mr. Himes from Wallace, Idaho, newly arrived to ranch on Bull River, and a friend stopped at Laramies to warm up and visit a spell before riding on to Himes homestead, where they were building and preparing for Hime's wife and family who were to arrive in about a month.31. Mr. Anderson took a load of furniture up Bull River (Monday) for Mr. Jim Daly who had moved his family into their two-storied long narrow house on a homestead on the North Fork of Bull River. Their two sons and two daughters added more children who would need schooling. A nurse homestead beside them.32. The Marlows moved onto their Rock creek ranch; Herman Manicke was settled on the northside of the river downstream from Noxon about three miles.33. The Larson brothers bought Ed Hampton's ranch. Ed Hampton rented David Evans ranch but only for a month. Then they moved into Mrs. Legault's restaurant.32. Thomsons, the NPRR depot agent, were given a farewell dance prior to their transfer back to Helena. Although George Phillips traded his home place for property in Spokane and also for some land in the Spokane valley near Post Falls he remained in the area.32. Phillips traded his team to some movers for a span of mules which he kept a month then sold to F. Harris for $300.34. Caption: James Bauer homestead in early 1900s. Courtesy Clayton Bauer collection. James Bomar, his wife and parents arrived on the NPRR with a boxcar of belongings. William Bomar moved onto Mr. Hayes place in Pilgrim creek. Bomars were musicians, which of course made them instantly welcome and popular. Mr. and Mrs. Henry Garred were also popular musicians so N. E. Ellis had no trouble engaging music when he held a big dance in his new barn. Clifford Weare was putting up a new barn on his homestead.35. As the homesteader's families grew, their income needs increased also. Crops were plentiful, gardens were bountiful, wild game and fish provided ample meat, but cash was increasingly scarce. As more ground was cleaned of timber and seeded to hay they started a few dairy herds. Will Ellis purchased some registered Holstein stock and, intending to start a dairy farm, in March he added a carload of Holstein cows brought from Bonners Ferry.36. Creameries began soliciting ranchers for milk, cream, and poultry. Not all of them were honest business men and after receiving numerous complaints the State Dairy Commissioner published notices in the newspapers cautioning ranchers to beware of "certain creamery promoters and builders" who were fleecing the people by making them subscribe large sums of money to build and equip a creamery and then only giving them about half of their moneys worth in return.37. Despite rumors to the contrary, homestead land was still available. Attempting to promote more settlement, now that timber sales had fallen off seriously, the government gave the following story to the news editor. "The idea prevails that all of the desirable land within the Cabinet National Forest and open for settlement has long ago been taken up and appropriated. According to the status records kept by the local forest service here this is not true ... there are still remaining parcels of river bottom and valley lands, principally west of Thompson Falls that is vacant, within the National forest which has been listed with the Department of the Interior and open to entry, but which has not been entered." Although the news item said, "A considerable portion of this land has been open for the past five years or more and is still open for entry", the nineteen parcels it listed had only been restored to entry between 1914 and 1916. The properties ranged in size from seven and a half acres to eighty acres. Some of them were contiguous and could be combined to create larger homesteads. Forest officials said work would be started on examination of 43,370 acres of land within the Cabinet National Forest Reserve "for the purpose of throwing the agricultural land open for settlement," The work would be under the supervision of representatives from the department of the U. S. Bureau of Soils of Washington, D. C., and would take "nearly all summer."38. 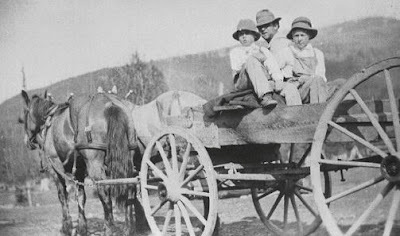 A few families were left to cope with ranch as their menfolk went wherever available work would bring them cash wages so they could pay their taxes. Granny Gordon, who was an experience timber scaler, was estimating timber at Connally's ranch. Engle went to Sommers to work for the summer;39. Mr. Fulks went to South Dakota to farm there for the season, taking Goldie and Willie with him.40. Cora Elphick sued for divorce from her husband, William Elphick for deserting her and their five minor children. Six weeks later the divorce was granted and she married William Messer.41. With all the activity on Bull River it didn't surprise the county commissioners that another school was being "talked up". April Fools Day was school election day. By election time there were 121 registered voters but only 30 voted that spring. Sixteen cast votes in favor of Woodrow Wilson while Theodore Roosevelt received two on the republican ticket and five on the progressive.38. A large crowd from Bull river rode in to vote. 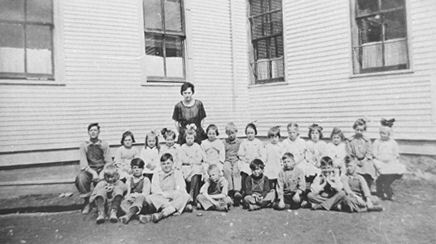 Connallys, Bakers, Carmichaels, Dalys in the upper Bull River needed a school close enough for their children to attend. They were eleven miles and more from Pilik School. Winter snow depths of four and five feet kept their youngsters home and illiterate. They were hoping to get one this year for upper Bull River children. Word was passed around at the election that the Bull River Booster Club was having a big dance at the (Pilik) school house the following Saturday. Mr. King was expected to arrive to play for it. Walter and Lula Lake were inviting people to come up Bull River on April 21st to a Hard Times dance they were giving in their new home. Anyone coming "dolled up" would be fined one dollar.40. Enroute to Lake's Hard Times dance, several families stopped at Howard Ellinwood's to inspect the big water wheel he had built on the creek flowing out of Star Gulch near his house. He had various uses in mind, including sawing his wood. It was May when "Sunday School" Brown and Ed. Hampton rode horseback up Bull River to count heads and see if there were enough children on upper Bull River to report to the county commissioners another school was warranted. The settlers didn't have to wait long for news that "a school house on upper Bull River is being started, between Collogan and Baker ranches. C. G. Himes has the contract." Wagonloads of lumber were hauled up and stored in Bakers barn on the riverbank. The lumber was destined to save a woman's life - but never became a school.42. Sanders County Independent Ledger, February 11, 1916. Sanders County Independent Ledger, January 14, 1916. Sanders County Independent Ledger, February 4, 1916. Sanders County Independent Ledger, February 4 and 25, 1916. Sanders County Independent Ledger, February 26, 1916. Sanders County Independent Ledger, March 14, 1916. Sanders County Independent Ledger, January 21, 1916. Sanders County Independent Ledger, February 18, 1916. Sanders County Independent Ledger, January 7, 1916. Sanders County Independent Ledger, June 30, 1916. Sanders County Independent Ledger, March 31, 1916. Sanders County Independent Ledger, April 7, 1916. Letter written by Helen Kirschbaum, February 16, 1974. Sanders County Independent Ledger, January 14 and 28, 1916. Sanders County Independent Ledger, May 19, 1916. Sanders County Independent Ledger, April 14, 1916. Sanders County Independent Ledger, June 23, 1916. Sanders County Independent Ledger, July 17, 1916. Sanders County Independent Ledger, April 28, 1916. Sanders County Independent Ledger, June 16, 1916.